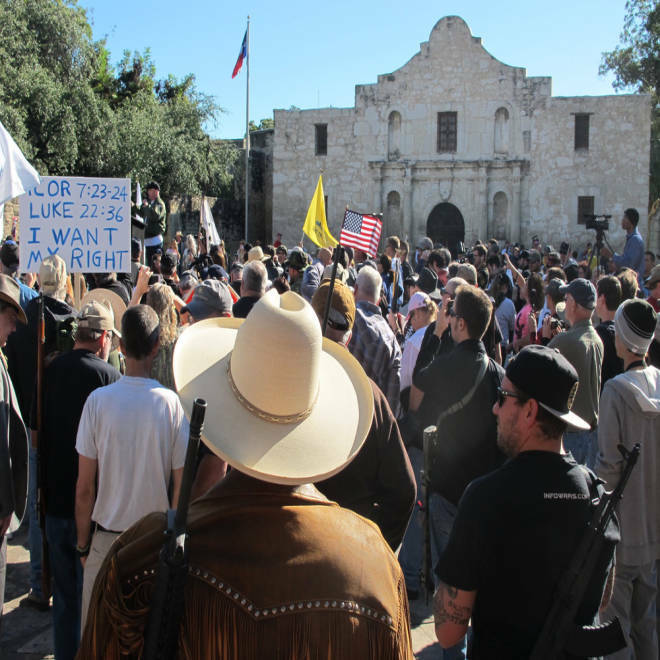 Gun-rights proponents flooded a plaza near the historic site -- considered a shrine of Texas liberty since a small band of Texans fought and died in a battle against Mexican forces there in 1836. Many of those gathered carried banners, flags and sundry firearms. The rally launched with remarks from organizers: “We aren't here to start a war today,” one said, according to the San Antonio News-Express. “We are here to show that an armed society is a polite society." Open Carry Texas President C.J. Chivers told the crowd that he wanted to hold the event in San Antonio, because of a confrontation between police and gun rights advocates a couple months ago, according to the Associated Press. "(The San Antonio Police Department) is no longer going to be messing with us," Chivers said from a podium, with the Alamo's famed Spanish mission behind him. The day's keynote speaker, Texas Land Commissioner Jerry Patterson, is a Republican candidate for the lieutenant governor and an avid gun-rights advocate. Patterson told NBC News that the rally was about the right of Texans to openly carry their pistols. According to Texas law, gun owners cannot openly carry handguns, but there is no such law prohibiting the carrying of long guns. San Antonio police have recently made arrests of people carrying long guns, citing a more restrictive city ordinance banning weapons in public places. “The premise is that someone who is openly carrying a handgun is not a criminal,” he said, adding that “criminals tend to be discrete” when carrying a hand gun. Patterson said he supports a person openly carrying a hand gun in most environments, excluding a bar. Victoria Montgomery, public relations manager with Open Carry Texas, told NBC News that Saturday’s rally was about “people who want to be free” and about the right to openly carry arms of all sizes. Montgomery said she is in favor of openly carrying a weapon in schools, restaurants and churches.